Last season at Reno Nationals, Colorado's Sarah Sturm had a big weekend in the Nevada desert. Wearing her special singlespeed jorts, Sturm finished an impressive second behind Meredith Miller in the Women's Singlespeed race. She then turned around and finished 12th in the Elite race the following day. Sturm's strong finish to the 2017/18 season and promising talent were rewarded with her first sponsorship deal when she signed with the Specialized / Tenspeed Hero program before the start of the cyclocross season. 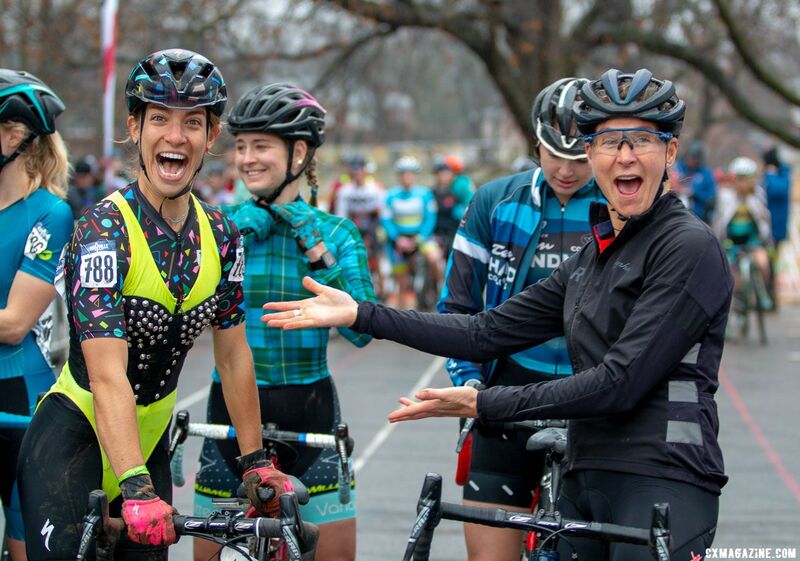 In the Women's Singlespeed race at Louisville Cyclocross Nationals, Sturm got to celebrate her first year as a sponsored rider in glamorous fashion. When one of the women racing in Saturday's Singlespeed race proposed racing as the "Glamorous Ladies of Singlespeed," Sturm knew exactly what to do. She pulled out her lucky singlespeed corset from the 2016 Singlespeed Cyclocross World Championships—a race she finished third in—and headed to the start line. Sturm won the race to make it a truly glamorous afternoon. Glamorous in the cyclocross sense, thanks to the thick mud everywhere at Joe Creason Park over the weekend. Sturm's win came on her colorful Specialized CruX painted to mesh with the program's colorful Tenspeed Hero kits. Sturm converted her race bikes over to singlespeed setups on Saturday before changing them back to geared bikes to race in Sunday's Elite race. 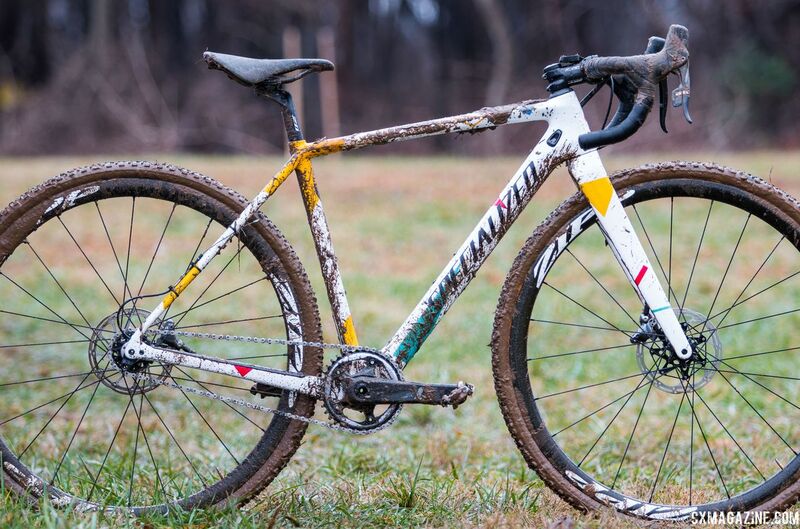 We took a look at Sturm's CruX in its muddy one-gear state following her Singlespeed Nationals win for this bike profile. At the beginning of the season, Sturm signed with the new Specialized / Tenspeed Hero women's cyclocross collaboration. Her teammate on the program this year was Canadian U23 National Champion Ruby West. Tenspeed Hero is known for its colorful cycling clothing, and both sides embraced that ethos in the collaboration. Artist Leah Guadagnoli designed a Tenspeed Hero team kit and then Specialized offered a limited edition helmet and pair of shoes in that same design. Also sharing Guadagnoli's design were the team's Specialized CruXes. The other CruX we profiled this season is that of Maghalie Rochette, who also counts Tenspeed Hero as a sponsor of her CX Fever p/b Specialized program. 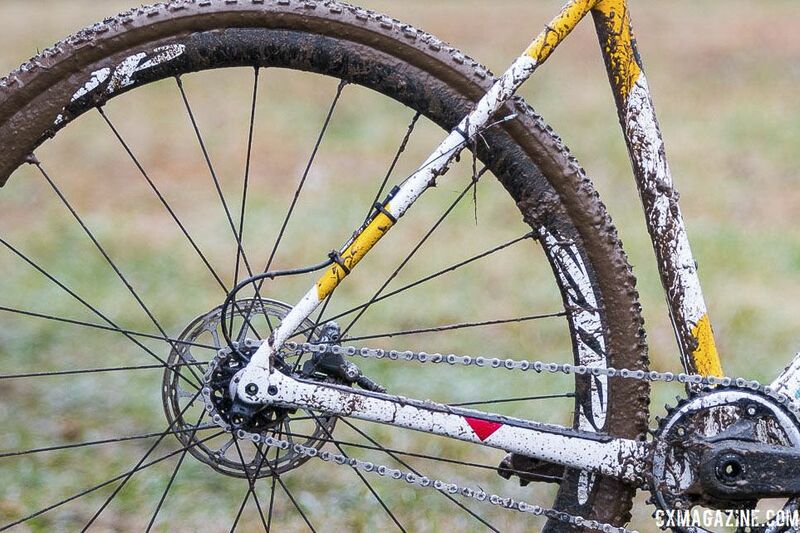 She ran the stock bright yellow and red frame of the CruX Expert build. We have also recently reviewed the top-end S-Works CruX as well. 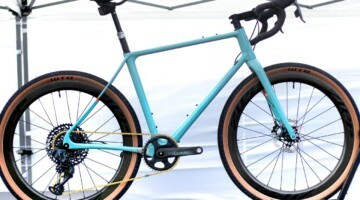 Sturm's 2019 model year Specialized CruX features the same redesigned geometry as the 2018 model year and is built with the company's Fact 11r carbon. Besides the Joe Creason mud, Sturm's biggest challenge was racing Singlespeed on Saturday and then the geared Elites on Sunday. She headed to Louisville with her two team bikes, ready to make some on-the-fly changes. "Originally we were only planning on having one bike converted, but due to the conditions, we had to act fast and get both bikes set up," Sturm said. "Having two bikes was absolutely critical, we pitted every half-lap." Last year, we saw Jake Wells win the Men's Singlespeed race on a Scott Addict CX converted to a singlespeed using a chain tensioner. Sturm said at first her team considered using a tensioner, but after arriving in Louisville and seeing the mud, they chose a different route. 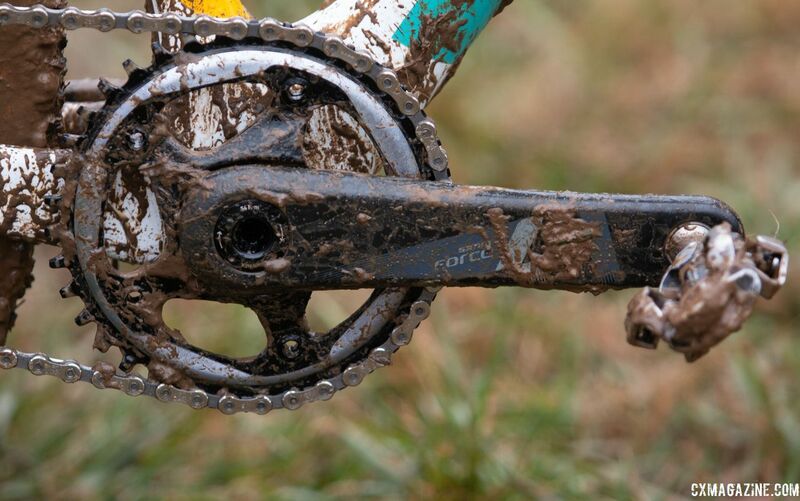 "Originally we were planning on using a chain tensioner, but with the muddy conditions, the setup was just skipping even with all brand new drivetrain parts," she said. Sturm and her team found the right fit between front chain ring and rear cog to achieve the one-gear setup. "We got super lucky with a magic chain setup," Sturm said about her bike. "We used brand new nine-speed chains and we just happened to have two of the cogs that worked with the magic chain setup." Sturm stuck with her 170mm SRAM Force 1 Crankset and an X-Sync chain ring in the front. 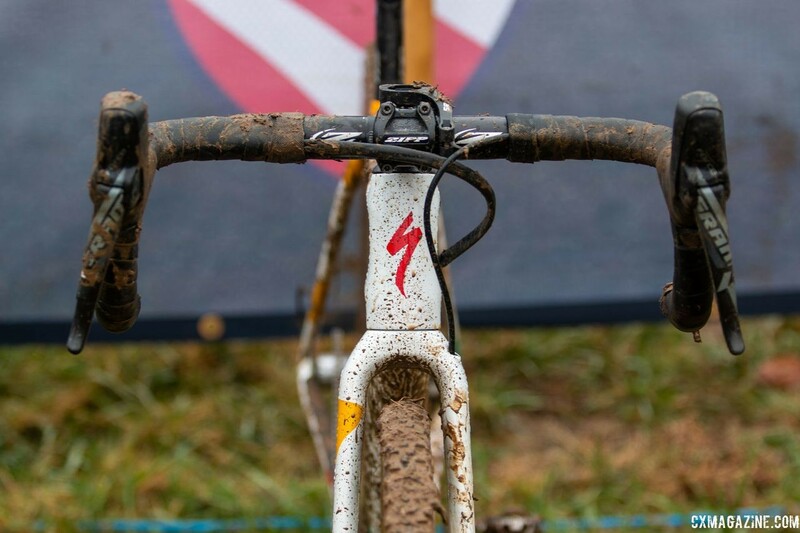 She removed the rear Force 1 derailleur, although the cable did not stray too far; Sturm zip-tied it to one of the seatstays so it could be reattached for Sunday's Elite race. The mud, of course, complicated things. "Unfortunately, despite our best efforts, we did have to re-cable the bikes after the Singlespeed race," Sturm said. Sturm and her team converted her Zipp 202 carbon disc tubular rear wheel to a one-gear setup by using spacers on either side of an 18-tooth Absolute Black narrow-wide cog. The chain choice came after some experimentation. 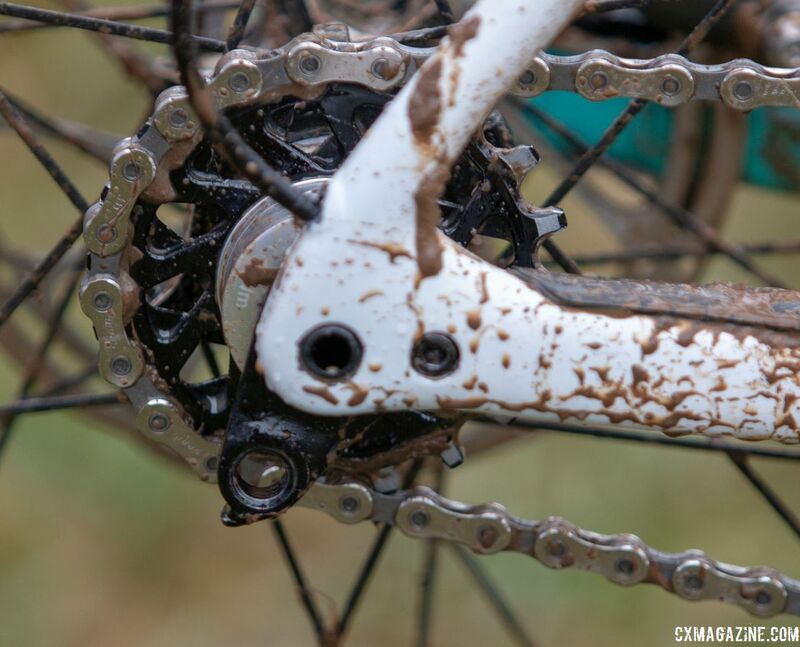 "The narrow-wide profile of the cogs was not working optimally with a 10/11-speed chain in the mud, so we opted for a 9-speed SRAM 991 chain for a tad bit more clearance," Sturm said. 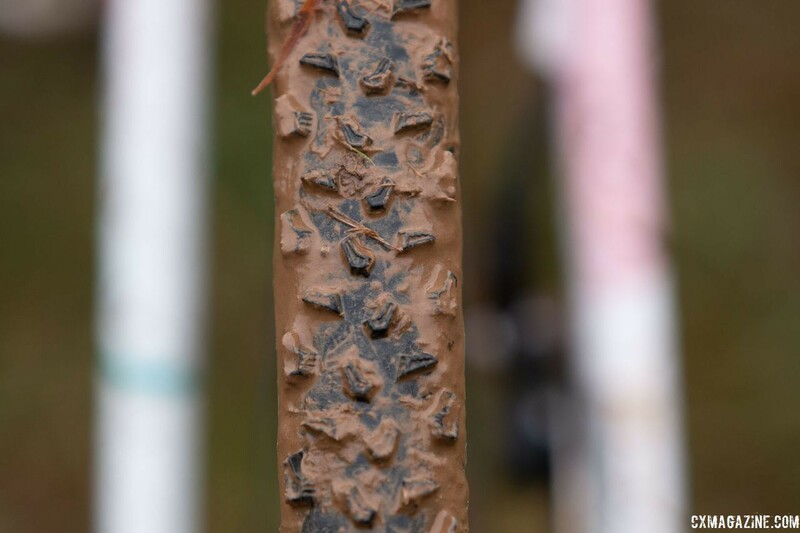 Like most other riders who raced over the weekend at Nationals, Sturm ran mud tires. She used the revamped Specialized Terra tires front and rear. One interesting addition Sturm made to her wheels during the Elite race on Sunday was Quarq TyreWiz pressure sensors with her Zipp 202 Firecrest tubulars. 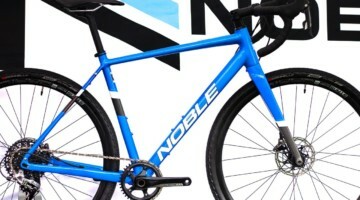 We saw Kaitie Keough and Sven Nys run them at the Dirty Kanza 200 last June, but this is the first bike we have profiled with the new sensors. Sturm said she is a fan. "The TyreWiz proved to be incredibly effective and efficient for checking tire pressures," she said. "The best part, is there is no taking a gauge on and off an open valve, so it's consistently accurate and easy to read the pressure right off your phone screen. Definitely going to be a regular addition to the quiver moving forward." 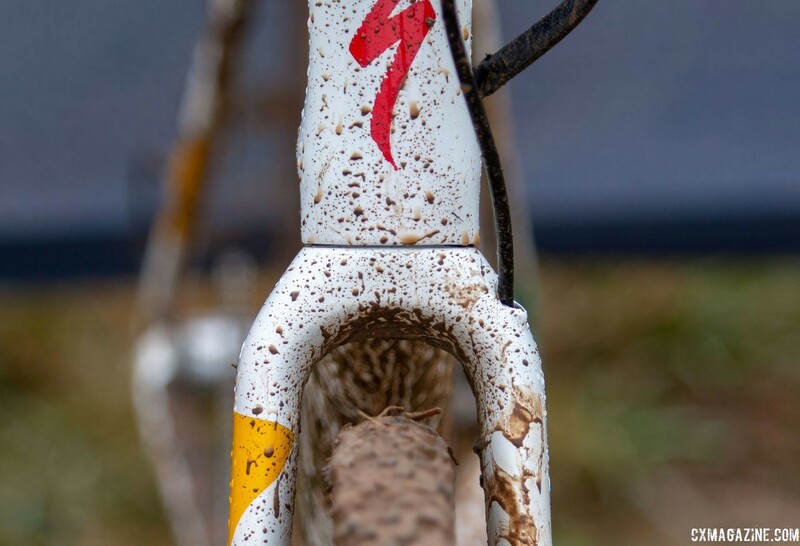 Sturm's brakes—to the extent that they helped in the Saturday Joe Creason mud—were SRAM Force HRD flat mount hydraulic calipers that bit onto 140mm Centerline rotors. 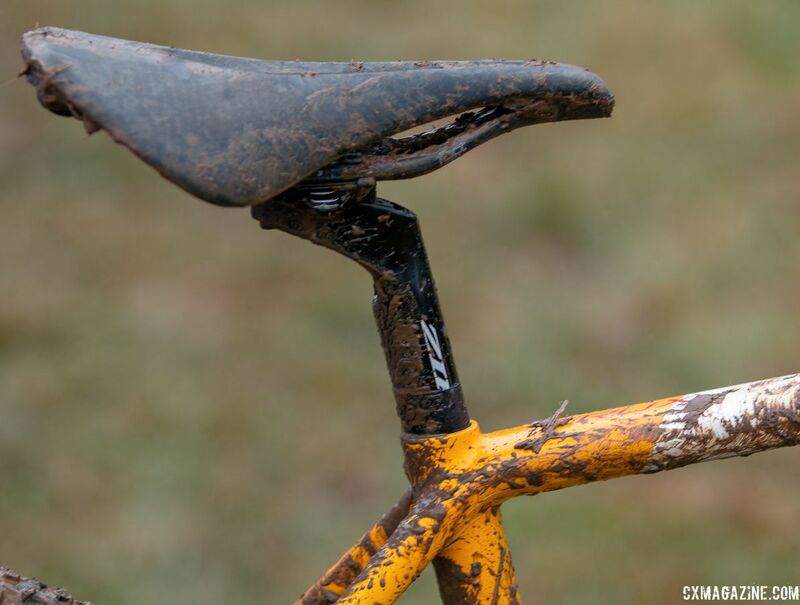 Her brake levers were SRAM Force HRD, although the shifting paddle was obviously just hanging out waiting to be reconnected with its rear derailleur for Sunday's Elite race. Sturm's cockpit consisted of a Zipp Service Course 80 handlebar and Service Course SL stem. Her seatpost was a Zipp Service Course SL (20) with 20mm of offset, and her saddle was an S-Works Power Arc with carbon rails. 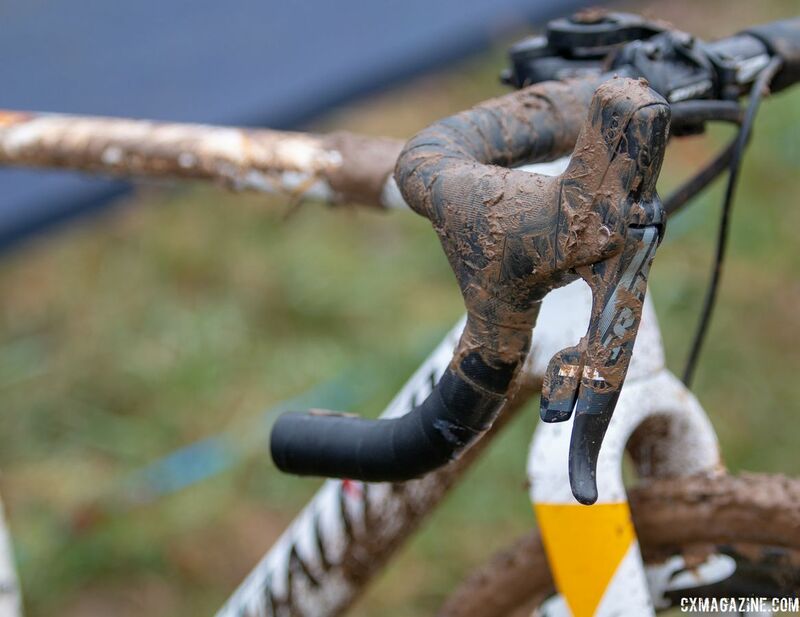 Her muddy pedals were Shimano XT PD-M8000 SPDs. 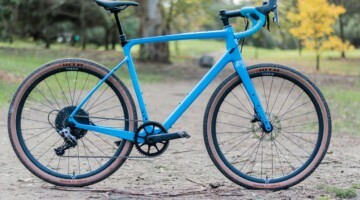 For a closer look at Sturm's glamorous Specialized CruX singlespeed, see the photo gallery and specs below. Sooo…the real question is..how did they tension the chain if there was no tensioner, horizontal drop out, eccentric BB, etc….??? Not easy to pull of, requires luck, and all mine is usually bad. In fact, were it not for the Bad, I would have no luck at all. what size is her frame?